EAW028472 ENGLAND (1950). The Devon Cleaning Works, Holy Trinity Church and environs, Notting Hill, 1950. This image was marked by Aerofilms Ltd for photo editing. Pennawd [EAW028472] The Devon Cleaning Works, Holy Trinity Church and environs, Notting Hill, 1950. This image was marked by Aerofilms Ltd for photo editing. Collett style Pannier tank, complete with GWR "shunters Truck"
GWR "Collett Goods" or 2251 class 0-6-0, not too common in London. This spur from Latimer Road station to the West London Railway was electrified for use by Hammersmith & City line trains to Kensington Addison Road, that service ceased in 1940. 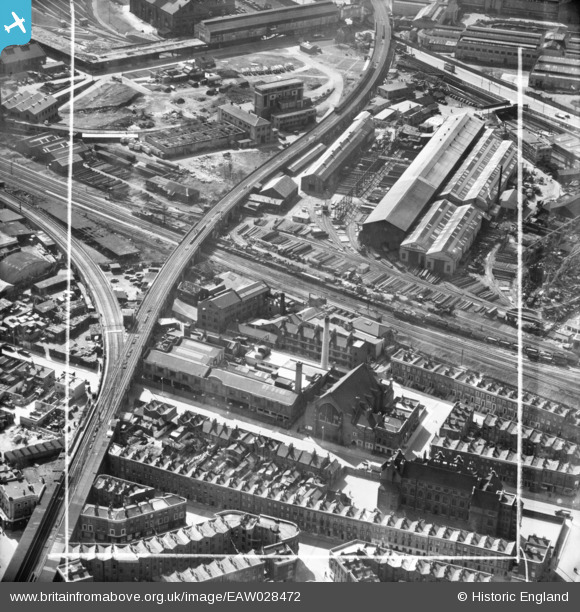 The Spur and viaduct have long gone too.